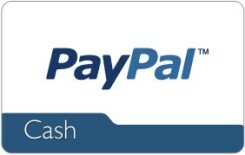 Get yourself a £10 PayPal e-Gift Card for free with Swag Bucks! PayPal is great alternative to carrying around cash and other cards. It is simple to use and is accepted at most stores and businesses! Want to turn your SB into CASH? This is your chance! When you snag this prize, £10 (British Pounds) will be deposited into your PayPal account. Use the money for anything - your gas bill, car bill, gifts - absolutely anything! The money will be sent directly to the PayPal account that is associated with the same email as your Swagbucks.com account. Your first and last name needs to be an exact match to your PayPal account information and your PayPal account needs to be verified. Under no circumstances will a payment ever be sent to a PayPal account with another email address, a different first and last name than what appears on your Swagbucks.com account, and an account that has not been verified with PayPal. For more information on PayPal account verification click here. Please allow 7-21 business days for payment to be transferred.